Welcome to our cycling holiday in Croatia offered by Hooked on Cycling Holidays. This bike tour is in Southern Dalmatia, the smallest and most sparsely populated region of Croatia, the route will take us past unique little towns and beautiful island countryside. This bike and boat cycle tour will allow you to experience the beautiful island of Korcula with its picturesquely situated old township, the wine growing peninsula of Pelješac and, to the south of the peninsula, the island of Mljet, with its impressive national park. Our tour guide shows you the fabulous towns of Trogir, Hvar, Stari Grad and Korcula, which are almost all protected under UNESCO‘s World Heritage list. Day 1 (Sat) Trogir (Embarkation) – Šolta Island. Individual arrival to the harbour of Trogir. After check-in on the motor yacht between 2 and 2:30 pm the first cruise starts around 3 pm. We shall sail from Trogir to Šolta Island. Overnight stay in the sleepy harbour of Stomorska. Day 2 (Sun) Islands of Šolta and Hvar 12.5 miles 20 km + 12.5 miles 20 km. On the island of Šolta we commence our first cycle tour of the day. Walled fields, numerous olive groves, locust bean and fig trees line the roads. The herbal scent of lavender and rosemary accompanies us along our tour across the island. Our visit to a local beekeeper offers an interesting impression on the production of local honey. 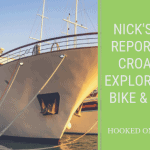 After cycling around the Island, we return to our ship in Stomorska and cross over to the lovely natural harbour of Stari Grad on the Island of Hvar. Our afternoon cycling tour leads us through the quaint harbour of Jelsa and Vrboska. Afterwards, we return to Stari Grad, which has become a Mecca for artists and art lovers in the past few years. Here we spend the night. Day 3 (Mon) Islands Hvar and Korčula 14 miles 22 km. Today’s tour leads us along the almost traffic free pass road through nice small villages to the islands capital, Hvar, where we visit the magnificent Renaissance Square and enjoy the view from the Spanish Fortress, situated high above the city. After today’s tour the boat takes us to the Island of Korčula. Overnight stay in Vela Luka. Day 4 (Tue) Korčula Island 38 miles 62 km. Today we discover the island of Korčula by bike and enjoy our lunch break in one of the local restaurants. The calmness and remoteness of the vast vegetation and cypress gardens have given the shape to the probably most beautiful Dalmatian island. Our cycle tour leads us via the village of Blato, along a pass road across Pupnat bay and finally to Korčula town, where we have time to take a walk through the wonderful old town with its narrow “fishbone like” alleys. We stay overnight in Korčula town. Day 5 (Wed) Brač Island 22 miles 35 km. We cruise to the island of Brač, which is famous for its shining white marble which was also been used in the building of the White House and the Reichstag in Berlin. After a lunch break, we start our cycle tour from Sumartin to the lovely fishing village Povlja or to the picturesque town Pučišća. Overnight stay in Pučišća. Day 6 (Thu) Omiš – Split 19 or 27 miles, 30 or 43 km. After a morning crossing to Omiš we cycle through the valley of the Cetina River which is surrounded by steep rocks. After around 20 km we have the choice to take part on a four hour rafting tour on the Cetina River (not included in the tour price) and afterwards a small cycle tour of about 10 km back to the boat, or to expand the cycle tour (no rafting) to 43 km along small side roads and a lovely landscapes until reaching Omiš with its pirate castles. In the afternoon our ship takes us to Split. The old town of Split, built adjoining the famous palace of the Roman Caesar Diocletian, is a world heritage site. Overnight stay in Split. In the morning we prepare for our last bike ride to Mount Marjan. A popular recreational site for the residents of Split, which offers fantastic views of the city and the surrounding islands. Afterwards, we board the ship and enjoy the last crossing to Trogir past the cliffs of the Čiovo peninsula. There is still plenty of time to visit the Old Town of Trogir, listed as a World Cultural Heritage site. The last evening aboard our ship is celebrated in traditional fashion. While enjoying the communal dinner in a celebratory atmosphere we will have the chance for a last get-together with our crew and tour guides. After breakfast disembarkation by 9 am and individual trip home or extended stay in Dalmatia/Croatia. The Kapetan Jure is a 27-metre-long and 7-metre-wide comfortable and spacious wooden motor yacht that was built in 2000. 11 of the 15 cabins are on deck. 10 of these are furnished with the two beds arranged side by side, while one cabin has bunk beds. The remaining 4 cabins are below deck, and are furnished with a French bed (140 cm wide) and a porthole. Captain Anton and his crew form an experienced team, which knows how to pamper their guests with delicious specialities. The cabins have simple, but functional equipment and are furnished with two beds and a small wardrobe or an open shelf. There is enough space for sleeping and storing a sea bag or a travel bag. Due to the shape of the ship’s hull, the size of the cabins may vary. However, a price differentiation is made only with respect to cabins “on deck” and “below deck”. The MS San Snova is a brand-new wooden motor sailer to be launched in spring 2009 and made exclusively for Island hopping cruises. The ship, constructed entirely of oak, was built in three years by the Scherka family in their own carpentry workshop as family project. The ship, 31 m long and 8 m wide, meets the highest expectations in regard to comfort, elegance and style, combining romantic seafaring with modernity and functionalism. Young captain Tonci, his brother Josip and ever-cheerful Jelena pride themselves in the meticulous appearance of the ship and the cordiality on board. The San Snova has five double cabins (with French beds 200 x 160 cm) and five triple cabins above deck (with French beds 200 x 160 cm and bunk beds 200 x 80 cm) as well as two three-bed-cabins and two four-bed-cabins below deck (all with single beds 200 x 90 cm). The fittings of the cabins as well as the saloon and the outside area are of superior quality with many carefully created details. The roomy sun deck offers comfortable mats for relaxing and lounge chairs are found on the afterdeck. So let yourself be pampered end enjoy the “Dream of Dreams” (San Snova), as the Scherka family named their new ship! The Romantica of captain Jure was launched only in May 2007. The ship is 32 m long and 7,6 m wide and it possesses a solid structural steelwork, which, as the name says, connects romance with modern trend and functionally. To the elegant appearance of his ship captain Jure pays a lot of attention: 17 comfortably equipped cabins with a size of 9-10 square meters also offer sufficient area to larger groups to accommodation. The generous cabins feature elevated equipment. The far sundeck offers couch mats for sunbathing and relaxing. A characteristic of the ship is a platform at the stern of the boat, from which you can take a bath in the sea in a very comfortable way.